Most of us wear the same old jewellery day in, day out, but what do you do if you fancy a new look but don’t want to shell out for expensive new jewellery? 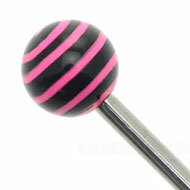 Our neon threaded balls make it easy to update your existing body jewellery and get a gorgeous new look. 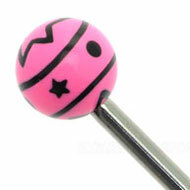 These threaded balls fit onto any threaded jewellery, from barbells and bananabells to labret studs. They come in a wonderful range of colours, sizes and designs, so you can customise your jewellery to create your perfect look. These plain neon balls are a best-seller and it’s easy to see why. They come in six amazing colours and they really stand out – the other colours are green and yellow. Each colour is available in five different sizes to fit a wide range of jewellery, from micro labrets to belly bars. Another advantage of this particular range is the soft feel of the balls. They are made from acrylic and feel much gentler on your skin than a metal ball. This makes them an excellent choice for facial piercings and ear piercings that can rub over time. We also have a great range of patterned balls. Below are just three of the designs – they come in a huge choice of different colours and motifs. Like the plain balls they have a nice soft feel and are great value, so you can have different threaded balls to match different outfits. This entry was posted in Acrylic Body Jewellery, Piercing Accessories and tagged Acrylic Threaded Balls, Body Piercing Threaded Accessories, Neon Body Jewellery, Neon Piercing Jewellery, Piercing Threaded Balls, Threaded Balls on June 15, 2012 by Piercing Guru. Make a bold statement this year with our fabulous UV threaded accessories. They will look incredible worn to all your special occasions this year and will definitely leave you glittering with style. Simply choose from our wide selection of threaded accessories which are available in a variety of eye-catching colours, shapes and sizes. Light up your look with this vibrant UV multilight threaded ball which will really make you stand out from the crowd. This fantastic value threaded accessory has gorgeous bands of orange, purple, blue, white, yellow and red which will catch the light wonderfully and give you a glossy finish every single time. This is perfect for absolutely any occasion and outfit so make sure you get your hands on this stylish threaded ball which will glow under UV light. Our incredible glitter green false eyelashes and special effects UV body paint will complete your look and give you the perfect party girl look. You will have loads of fun wearing this cute multilight ball with all your favourite jewellery and accessories. 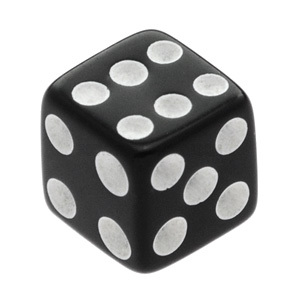 Get a unique and eye-catching new look by wearing this impressive UV black threaded dice with UV reactive white numbers which will instantly update your style and amaze all your friends. Our UV dice very comfortable to wear and will look incredible paired with our professional quality makeup and eyelashes. Our glamorous zig zag black false eyelashes and Ben Nye silver aqua glitter paint will draw everyone’s attention to your beautiful eyes and will look fabulous with your attention-grabbing black threaded dice and glittering silver jewellery. This entry was posted in Balls and Accessories, Gifts and Accessories, Piercing Accessories, UV Body Jewellery and tagged Body Piercing Threaded Accessories, Piercing Threaded Balls, Threaded Accessories, Threaded Balls, uv, UV Accessories, UV Balls, UV Body Jewellery, UV Body Piercing, UV Jewellery, UV Piercings on November 21, 2011 by Piercing Guru. Have some fun customising your piercing with our threaded accessories perfect for any piece of body jewellery. Choose from a wide range of threaded accessories available in a variety of colours and sizes to screw onto your bars. Our eye-catching designs and colours will look fabulous with almost any outfit and occasion. All of your friends and family will be impressed with your amazing quality threaded accessories which will look great on. 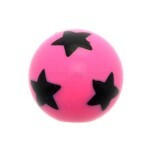 Brighten up your look with a neon pink stars acrylic threaded ball which will look amazing with all your body jewellery pieces. 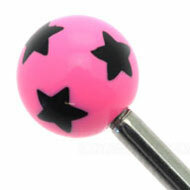 Made from acrylic, these cute pink balls with sweet black stars will feel fabulous on and will screw on easily to your barbell stem. These are perfect for achieving glamorous style for an affordable price. You will love wearing this lightweight threaded jewellery piece to all your days out, parties, concerts, gatherings and many more! Have a look at our other acrylic threaded balls which will really make you stand out from the crowd. Get hold of this season’s hottest style with our gorgeous synthetic pearl ball. The soft natural cream colour will lighten up your look and will add glamour to your fashionable vintage looks. Everyone will be jealous of your fantastic threaded accessory which can be screwed onto either end of your barbell stem. Mix and match our breath-taking range of threaded balls this year and give your new look a beautiful glossy finish which will certainly grab everyone’s attention. These are available in a wide range of colours from pink and blue to white and grey so make sure you grab your favourite colour before they all sell out! Collect all of our affordable, vibrant coloured balls which will pretty up your look. This entry was posted in Adult Body Jewellery, Balls and Accessories and tagged Body Jewellery, Body Piercing Threaded Accessories, Body Piercing Threaded Accessory, Pearl, Piercing Threaded Balls, Piercing Threaded Stars, Threaded Accessories, Threaded Balls on September 8, 2011 by Piercing Guru.